Ecosa was founded in Australia in 2014 with the goal of helping people sleep better. They originally wanted to create a mattress that could solve back pain issues. However, their research and development team became obsessed with creating the “perfect” mattress. They realized that this would be difficult because everyone is so different, but they couldn’t give up on the idea. Hence was born the adjustable memory foam mattress, with it’s three different firmness levels (medium, medium-firm, and firm). The firmness levels span from 6-8 on the mattress firmness scale, which is in the range of the majority of people. In striving for perfection Ecosa also met their original goal, with more than 70% of Ecosa users reporting improvement with their back problems. Ecosa mattresses are only available online and they ship directly to you, compressed and rolled up in a small, easy to handle box. This keeps costs down because they don’t have the huge overhead of running retail stores and paying salespeople. Ecosa offers a 100 night in home trial. If for any reason you decide that it isn’t for you, they will schedule a free pick-up and will refund your entire purchase price. This doesn’t happen often as the return rate on Ecosa mattresses is among the lowest in the industry at only 2%. Any returned mattresses do not get resold. Instead, they are donated to charities or families in need. If you love your new Ecosa mattress, you can rest in peace for years, knowing that it is covered by a 15-year warranty. Ecosa mattresses are made out of three layers of high-quality cutting-edge foam, and two covers, to give you the best possible sleeping experience. The bottom layer is made out of 6.5″ off dense poly foam. This is the support layer. It is sturdy enough to allow the mattress to be placed on any surface, including the floor. It is yellow colored and has grooves in it to allow airflow and prevent heat build-up. This is the layer that gives you support for proper spine alignment and even weight distribution. 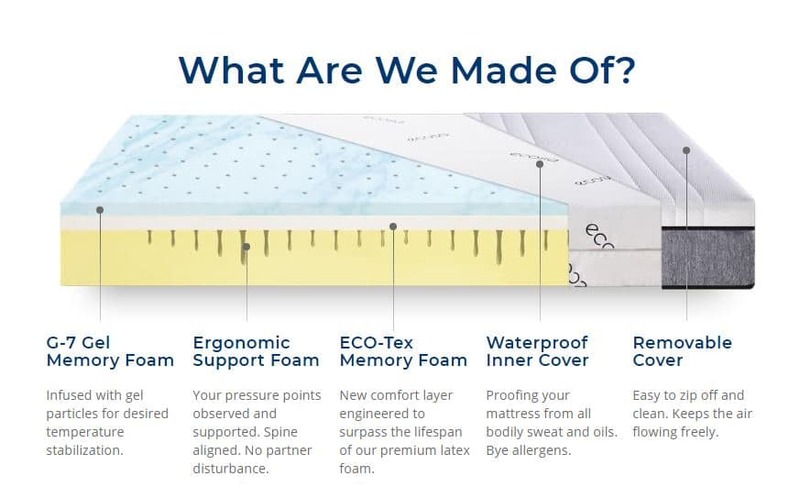 Ecosa’s proprietary Eco-Tex memory foam makes up the middle layer. This layer is white and is 1.5″ thick. 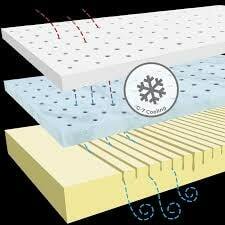 It’s an aerated foam layer that has an ultra quick response time to keep you from feeling stuck in the mattress. The top layer is comprised of the company’s G-7 Memory Foam and is 1.5″ thick. 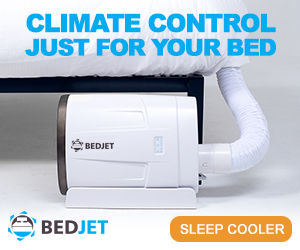 G-7 is designed with gel particles suspended in it that keep you from getting too hot while you sleep. This layer contours to your shape and relieves pressure points, but you still won’t sink too deeply into it. You can identify it by its blue color. The covers that come on Ecosa mattresses are a really nice bonus feature. The outer one is simply a zippable polyester cover that can be thrown in your washing machine. The inner liner is dust mite resistant, bed bug resistant, and waterproof, eliminating the need to buy a separate mattress protector. Ecosa does a great job of dispelling the myth that memory foam mattresses are hot sleepers. 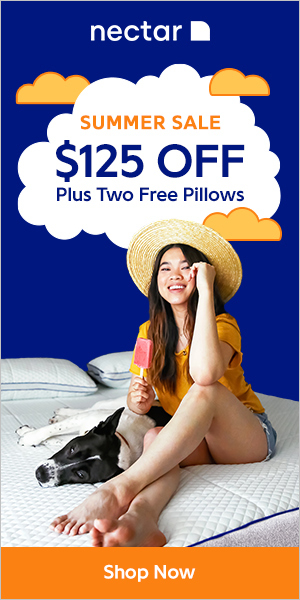 While it is true that older ones did retain a lot of body heat, all modern memory foam of any quality has been designed to keep you cool and comfortable while you sleep. Ecosa does a fantastic job of accomplishing this with their proprietary G-7 gel foam and their built-in air circulation system. This system allows air to flow freely through the pin-core holes which they have incorporated into all layers of their mattress. As you know, one of Ecosa’s key selling features is the fact that you get the option of three different firmness levels in one mattress. “But how do I change the levels?” you ask. Easy. All you have to do is unzip and pull back the cover. The firmness is adjusted by switching the order of the foam levels. The mattress comes in its softest configuration, allowing you to sink down into the memory foam a bit. If you like your mattress a little firmer, you can flip the top layer over to get a bouncier latex-like feel. You can achieve the firmest setting by putting the dense poly foam layer on top. This provides good lumbar support and proper spinal alignment and is generally better for people with heavier weight considerations. Ecosa is firmer than a lot of the other matresses on our Top Ten Best Mattresses List. Even at it’s softest level (medium), we would rank it at a 6 or 7 on the firmness scale, which evaluates mattresses from 1 – 10 with 10 being the firmest. For this reason, it may not be the best mattress for side sleepers, although some will find the medium level to be sufficiently soft for side sleeping. Ecosa recommends the medium level for sleepers up to 195 lbs. This firmness layer has the G-7 foam on top which will let you sink in a little more than the other layers. The medium-firm configuration is a little firmer and bouncier than the medium one, coming in at a 7-8 on the firmness scale. This is a good firmness for back sleepers or anyone weighing more than 195 lbs. It still molds to your body slightly but also provides the support you need. At its firmest, the Ecosa measure an 8 or 9 on the firmness scale. This is designed to keep your spine and neck in a neutral position. It is also able to provide adequate support for people weighing up to 440 lbs. This layer is best for stomach sleepers as it is firm enough to keep your hips level with the rest of your body. If you are looking for an adjustable mattress for a good price, Ecosa might be right for you. Although it could be too firm for some sleepers, it's going to be a good fit for the large majority of people. With a lot of nice features and no major flaws, Ecosa is a great value for the money.